The 17th century scientist Christiaan Huygens discovered that objects in the universe have a tendency to come in harmony with each other, a phenomena that we now know as “entrainment”. All what exists (like e.g. atoms, planets, herds of animals and also every aspect of our human fysiology), has the tendency to strive to harmony. So this is about the tendency of two moving objects to come into one rhythm so that they move in harmony. It is a physical phenomenon that influences all of us. A well known example of entrainment is two clocks that hang next to each other that go ticking the same rhythm after a while (in phase). Or what to think of individual pulsating heartcells that will pulsate simultanuously when they come in each others neigbourhood or women who’s cyclus will go more or less simultanuous when they live in the same house for a while. Nature has a lot of examples. 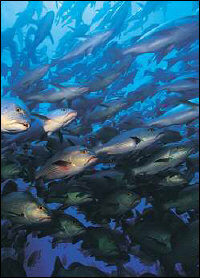 Think of groups of fish or birds that all seem to follow an assumed leader. So entrainment is about mutual energetic influence. People also react in resonance with the vibrations in our surroundings. The physiological functioning of the body is (partly) influenced by vibrations like e.g. sound. It doesn’t matter what the soundsource is ( e.g. an instrument, the human voice or some object in our surroundings). Through the proces of entrainment sound can transform negative and surpressed emotions into a state of evennes that immediately influences our physiology. In this way entrainment can recuperate the balace between our core (the essence of who we are) and the universe. The effects of entrainment manifest themselves on the fysical, emotional and spiritual level. All the systems in the human body have their own rhythm (muscles, heartbeat, nervous system, respiration, blood circulation). An investigation of o.a. W. Condon ( a scientist at Boston University School of Medicine) proved that brainwaves of people who have a conversation will become the same frequency. This only happened when the people concerned thought that they have had a good conversation. An other scientist (J. Kneutgen) showed us that when baby’s went to sleep while listening to lullabies, that their breath was in sync with the beat of the music when they were asleep. Various other researchers proved that music influences our bloodpressure, the heartbeat, the breathing and other parts of our autonome nervous system. 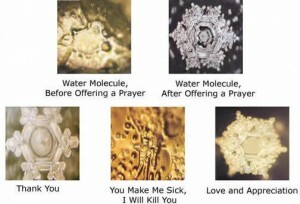 A scientist like Masaru Emoto showed us repeatedly how sound influences the structure of water. When you then realise that we humans consist of water for almost 70% ……..
Our individual possibilities concerning entrainment, or the way we are capable to vibrate in harmony with others, enables us to feel the connection with the world around us. Without entrainment (in fact the basis of all communication) we lead an isolated life instead of an existance in harmony with the universe. Healing is restoring the harmony through wich we are capable of connecting with our own life energy or essence. When used properly sound will entrain the human body in the direction of more harmony and homeostasis that it needs to be healthy and cheerfull. It will affect the immunesystem in a positive way.